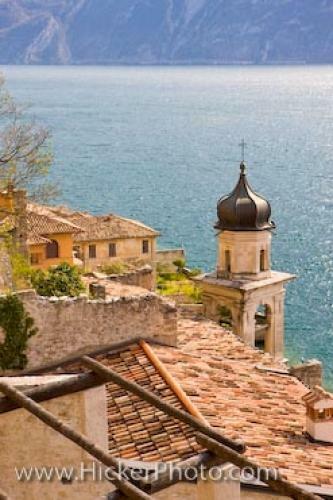 The Province of Brescia offers a perfect option for a European vacation destination with the town of Limone sul Garda. This picturesque town in Italy is situated on the shores of Lake Garda in the Region of Lombardy. In the Province of Brescia there is a town that is a popular vacation destination amongst travellers to this part of Italy and the town of Limone sul Garda looks just like one would imagine a small Italian town to look like. Italy has many treasures such as this one, which is located on the shores of Lake Garda in the Region of Lombardy. This name of this town comes from the word limen, which means border, and not the word lemon as most people would think. Lemons are grown extensively throughout the region of Brescia however. Limone sul Garda has a long and extensive history, as a settlement has existed on this site since Neolithic Age. The Romans even set up a small town here sometime around 200 BC. the shores of Lake Garda in the Province of Brescia, Italy. Pictures from photo gallery "Italy Pictures"
This picture is part of the photo album "Italy Pictures" - there are more beautiful images waiting for you. ... The oil has a distinct fragrance and taste due to the climate and the good soil in which the plant is grown. The olives are pressed using the old cold press method so all the benefits can be harvested and then sold in the local shop. Town of Limone sul Garda on the shores of Lake Garda, Province of Brescia, Region of Lombardy, Italy, Europe. I photographed this photo with the digital SLR camera model Canon EOS-1Ds Mark III, aperture of f/5.6, exposure time of 1/80 sec. on ISO 50, as always I used a original Canon Lens, the focus lenght for this picture was 70mm.